There was once a small, small girl and a big, big bird. Her name was Matica and his name was Tamo and “Talon” is the book that tells us all about their unlikely friendship and adventures. It was through these adventures that Matica (and I, too) learned that no one is too small in the eyes of God and that He has a grand plan for each one of us. Read “Talon” to your very young ones to teach them that they are in God’s thoughts and intentions; that life can and will get better; that our own problems and shortcomings can become our greatest allies and advantages; that nature is not lost yet, that it is our right and our home and that this planet belongs to all of us… and to none of us. Read them “Talon” to help them learn to fly. 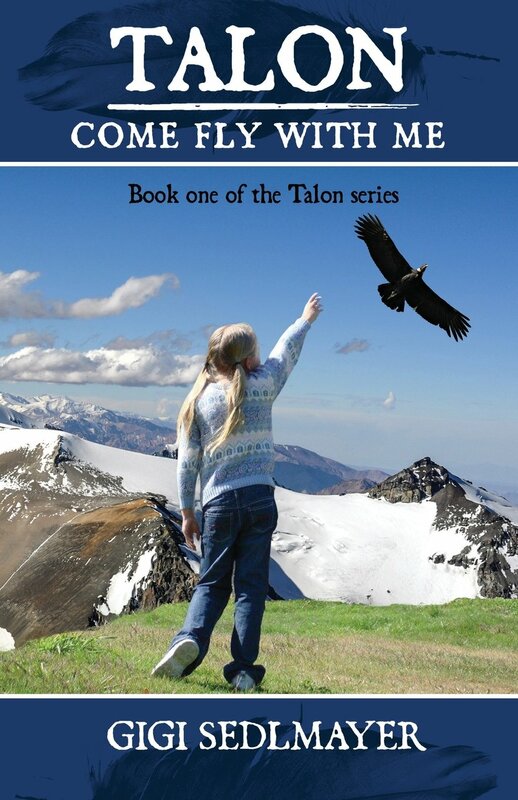 “Talon, come fly with me” is the first of five books written by Australian author Gigi Sedlmayer and it tells about the adventures of tiny Matica and her pet condors Tamo, Tima and Talon. Hubo una vez una pequeña, pequeña niña y un gran, gran pájaro. El nombre de ella era Matica y el nombre de él era Tamo y “Talon” es el libro que nos cuenta todo acerca de su improbable amistad y de sus aventuras. Fue a través de estas aventuras que Matica se dio cuenta (y yo también) de que nadie es demasiado pequeño a los ojos de Dios y que Él tiene un gran plan para cada uno de nosotros. Lee “Talon” a tus más pequeños para enseñarles que están en los pensamientos y las intenciones de Dios; que la vida puede y va a mejorar; que nuestros propios problemas y deficiencias pueden ser nuestros mejores aliados y ventajas; que aún no hemos perdido a la naturaleza, que la naturaleza es nuestro derecho y nuestra casa y que este planeta nos pertenece a todos nosotros… y a ninguno de nosotros. Léeles “Talon” para ayudarles a aprender a volar. “Talon, Come Fly With Me” es el primero de los cinco libros escritos por la autora australiana Gigi Sedlmayer y habla de las aventuras de la pequeña Matica y de sus mascotas cóndores Tamo, Tima y Talon. This entry was posted in book review, Children books, Uncategorized and tagged Children books, ebook review, Gigi Sedlmayer, Matica, Talon on March 15, 2014 by Jose Luis Cortes. You are welcome, Gigi. My pleasure. Best, Joe.